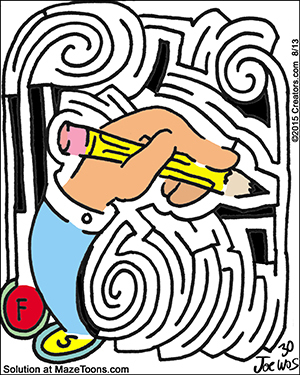 This was the sample Sunday formatted maze I used in my submission to Creators Syndicate. I actually got the format wrong for a Sunday feature but thankfully they took me anyway! I was still experimenting with the style and coloring as well. Previous Mazes for the Holidays! Next A special Peanuts MazeToons Maze!